Greenwich+Docklands International Festival (GDIF), founded in 1996, is now a well-established date on the UK outdoor arts calendar – the former Greenwich Festival developed, over the past eighteen years, into the cross-river cross-artform GDIF by artistic director Bradley Hemmings. The festival comprises numerous elements: the main programme presentation of large-scale national and international outdoor arts work; the Greenwich Fair, a family-friendly weekend of smaller-scale outdoor theatre, circus, dance, installations and sideshows; and Dancing City, which animates Canary Wharf with dance and aerial circus work that captures the creative imaginations of London’s city workers during their lunch breaks, culminating in a Saturday full of dance works in what becomes a strange ghost town of empty offices at the weekend. The main programme showed the festival’s usual extraordinary range of large-scale work from across the globe, including: the UK’s Metro-Boulot-Dodo with Safe House, a Without Walls commission; Voalá, an op-art aerial choreography extravaganza by Spanish–Argentinean company Muaré; French company Rara Woulib’s Deblozay, a promenade dance-of-the-dead exploration of Haitian culture; and the much-lauded War Correspondents, Helen Chadwick Song Theatre’s tribute to journalist on the frontline, in which testimonies, music and physicality fuse into a powerful, multi-disciplined song cycle performance. Light The Fuse installed a bus stop installation directly beneath the Cutty Sark ship for Full Stop. The performers embark on a whistle-stop tour through countless characters that arrive at the bus stop for a short while and then disappear on their journeys. Comedy, dance and countless costume changes bring lots of laughs from the audience however the rushing rhythm of the piece feels rushed in its making also. A more thoughtful movement vocabulary and subtle characterisation would help it live up to the expectations set by the clever bus stop installation, so at home in the cityscape. (i)land by Marc Brew Company slows the pace right down as audiences sit back away from the crowds in the Cutty Sark Gardens listening to the ebb and flow of the sea by the river. Marc Brew recreates the beach at Greenwich, hiding in a sand dune swept up around a mast. This is a piece for dreamers. It immediately transports you away from London to a mysterious other world where the audience can contemplate the fate of the three performers twisting, turning and playing in the sand. Performing in the blazing heat of the sun on the bright yellow sand, expression and characterisation are sometimes lost and exquisite pointing and measuring motifs appear only fleetingly. Maximising the potential of movement motifs, object play and characterisation would highlight the choreography which at times blends into a blur of figures twisting and rolling in their sandy bed. The piece, however beautiful, is at risk of falling foul of its dreamy, enticing but almost melancholic nature, particularly when performing in the unforgiving nature of the bright summer sun. Increasing the pace and dynamic of the faster movement sections to adjust for the performance site and weather would keep this piece on par with standards set in previous showings. Te Odiero, by Spanish dance-circus company HURyCAN, is a short and snappy duet that draws out a lover’s tiff into a love/hate relationship verging on the grotesque. Quirky and comical, the male dancer’s subtle facial expressions captivate the audience before he embarks on a distorted tango with his partner. Head banging, hair pulling, biting and attacks of kisses are effortlessly fused with rapid and sensual footwork and lifts, making for an unusual and fast-paced piece. The second half saw a stronger focus on the duet’s acrobalance repertoire, the humour and dance vocabulary becoming somewhat subjugated to the needs of the circus lifts and balances. However, the tension between the pair’s silliness as a couple and the risks of the lifts, somersaults and contact work performed on the stone floor makes for a strong and captivating performance. Moxie Brawl, like Marc Brew Company, is key to GDIF’s commitment to integrated performance and is equally a key player in the line-up of dance at Greenwich this year. 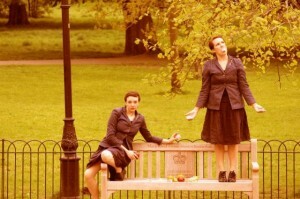 In Sit Back, a quartet of 1940s-styled glamorous women in clippy uniforms take the audience on a journey with a trolleybus service that travels the road of their personal highs and lows, whilst paralleling the wider context of the War. Well-known tunes filled the area surrounding The Royal Naval College with WWII spirits; ‘You Are My Sunshine’ went down perfectly on such a sweltering hot day. Energy levels did not dip once as the dancers bounded in, clicking their ‘head counters’, handing out tickets, and giving out verbal instructions. Counting audience members in on their journey with a meandering, spiralling 40s elegance, the movement vocabulary incorporated signs and gestures from their role on the bus service in a constantly travelling sequence forming and dissolving tableaux around the narrative of the piece. Receiving letters, rationed food and news from the radio, Moxie Brawl successfully spun an evocative journey through the War using speech, object play and voice over well integrated into a contemporary dance vocabulary that was a pleasure to watch. 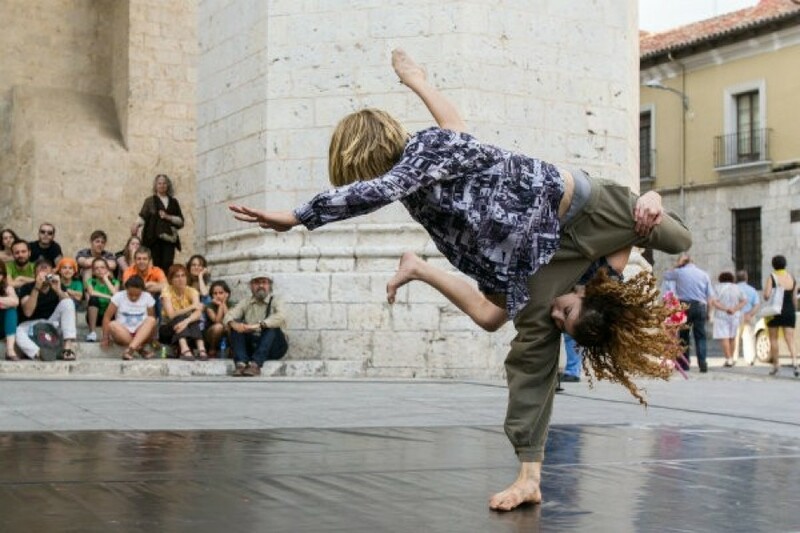 La Pelat by Joan Català (featured image, above) combines dance, circus skills, and poetic physical performance. Català balances a large wooden pole on one shoulder, moving rapidly beneath it as it circles and hovers precariously over the crowd’s heads. The piece begins as a beautiful and tentative exploration of the object, and then opens up to incorporate audience members into the play, building up to a climax using humour and repetition, culminating in one show-stopper trick as Català climbs to the top of the pole balancing high above the sea of people. GIDF’s annual nine-day celebration of ‘extraordinary outdoor events that transform people’s lives’ has grown and grown year-on-year, and in 2014 more than 80,000 people attended the outdoor shows across both sides of the river. It is undoubtedly set to soar to even greater heights in 2015 and beyond. Rebecca JS Nice attended Greenwich Fair on 22 June 2014. Additional reporting by Dorothy Max Prior. Rebecca worked as a dance teacher, lecturer and choreographer for eight years specialising in tap and jazz. She has a background in Art History and is currently training further in medieval history and contemporary choreography with a particular interest in live art. At the early stage of her dance writing career, Rebecca reviews and analyses theatre and dance performance and is working on a papers for publication.